Toast Topper #36: Blood Orange and Cranberry Marmalade #12WksXmasTreats | What Smells So Good? I don't know about you, but when it comes to Winter there's only one thing I like - the fruit. Don't get me wrong, I love my July cherries and late August peaches, but when the first blood oranges and Meyer lemons come in along with the crisp and juicy Asian pears and tart cranberries, I am in produce bliss. In fact, when it comes to holiday dinners, the cranberry sauce (homemade of course) is only ever touched by my mom and I - and I put it on almost everything... including leftover sandwiches and even my morning toast. With my love for winter citrus and cranberries being what it is, it was only natural that I was drawn to the recipe for "Orange and Cranberry Marmalade" in Preserving Made Easy by Ellie Topp and Margaret Howard (one of the goodies in my Summer Preserves Kit from #natrelpreserves). Since the first gorgeous, ruby-red blood oranges had made their way into my grocery store, I jumped at the chance to use their complex, full bodied flavour and aroma in the marmalade rather than the (still adequate but less intense) navel variety. Local fresh cranberries left over from our holiday dinner finished off the body of the mixture, and a light tinge of vanilla from infused sugar added a bit of "special occasion" flair. I hate to say it, but it may have become my new favourite Toast Topper, and is definitely going in my holiday gift baskets this year! With such a festive colour and flavour profile, this is a perfect holiday option this Winter. 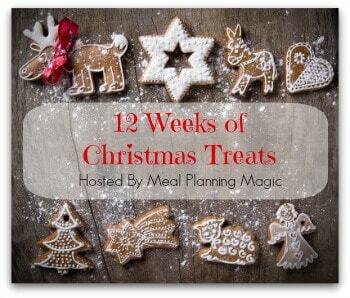 Check out all the other offerings at the 12 Weeks of Christmas Treats hosted at Meal Planning Magic this week too! Peel the zest from the orange and lemon with a vegetable peeler or zester. Place in the pot with the water and bring to a simmer. Cook, covered, for 20 minutes. Meanwhile, peel the pith off and chop the flesh of the citrus with the cranberries in a food processor or blender. Add to the pot and bring to a boil, then reduce heat, cover and cook 15 minutes. Add the sugars and bring to a rapid boil, stirring often. Boil until the mixture reaches the “gel” point (either tested on a plate from the freezer or by the “sheet test” from a spoon). Ladle into sterilized jars and process in a waterbath for 15 minutes.